A Taste of Fort Greene’s Future! Big props go out to everyone who worked or played at AFROPUNK Fest 2013! It is a great Fort Greene summer tradition, and we can hardly wait to see the lineup for 2014! Turf the Slab was particularly excited to see a long procession of food trucks lining Navy Street and bicyclists swarming around Commodore Barry Park. Welcome to the future! Turf the Slab wants Commodore Barry Park to be a community destination more than once a year. Why not every weekend, day and night? Imagine gleaming new turf fields crowded with athletes young and old, with an endless parade of runners circling them on a Mondo track. The crowds come out to cheer them all on. Bicyclists stop to catch a breath. And everybody lines up to grab a bite. A regular crowd is great engine for local entrepreneurs, and food trucks could not ask for better, more reliable customers than hungry sports fans in a veritable food desert. 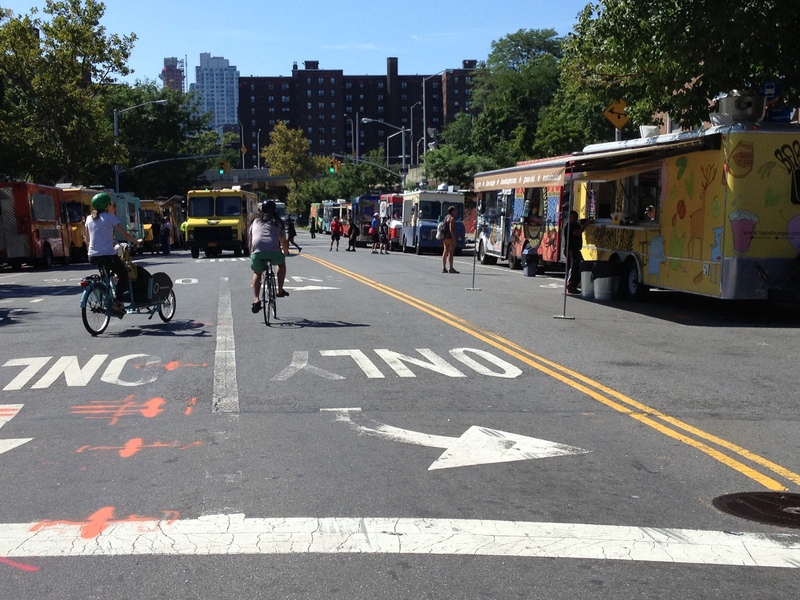 Just ask the pupusa truck at the Red Hook ballfields!